Hope Town is a gem. It combines the small, intimate harbor of Cuttyhunk with the ambiance of Nantucket - but with warmth, sunshine and blue water. If you are cruising the Abacos, it is a must-visit place. Hope Town Map with facilities & attractions. Check out Elbow Cay for information in immediate surrounding area and White Sound. Locair; 242-366-0069; 1-800-205-0730 (US). Service to St. Petersburg-Tampa Bay; Orlando, W Palm Beach (April 2010). Silver Airways; has great service from Abaco to W Palm Beach, Orlando, Tampa, Jacksonville. The inner harbor is limited in size with essentially no room for anchoring as moorings dominate most of the area. Rental moorings are available. The Jib; 242-366-0025; schadtha@gmx.de. Original watercolors & prints; Bahamian fabrics and products. Dr. Hermann Schadt & his wife are resident artists working in watercolors, acrylics, and oil; they take special commissions for house, boat and landscape paintings. Sad note: The Hummingbird Cottage Art Center, a gallery and exhibit center formerly located in two beautifully restored buildings and a beautiful garden overlooking the ocean with art exhibits and sales of works by local artists is now a private home. Back Creek Bakery; Fridays, 1400 - sell out; at Post Office Dock. Hope Town Coffee House offers pastries. Vernon’s Grocery; 242-366-0037. Vernon’s Uppercrust Bakery and Grocery is famous for its pies and fresh bread. Don't miss Vernon's signature key lime pie! First Caribbean International Bank; 242-366-0296; 242-367-4644; 242-366-0035. Has limited office hours. Captain Jack's. Wholesale to-go pricing on beer and liquor for sale. Hope Town Wines and Spirits; 242-366-0525; hopetownwines@abacoinet.com; VHF Ch 16. Located at Lighthouse Marina. Free Delivery. New Hope Wines & Spirits; 242-366-0525. At Lighthouse Marina. Wine Down Sip Sip. Wines. Bike Shop; across from Harbour’s Edge Restaurant. ; 242-366-0087. Abaco Multihull Charters; 242-366-0522; 207-529-6500. Castle Harbour Sailing School at Club Soleil. Cat’sPaw Boat Rentals; 242-366-0380; catspaw@batelnet.bs; VHF Ch 66. Sea Horse Boat Rentals; 242-366-0023; VHF Ch-16. Island Marine Boat Rentals; 242-366-0282; info@islandmarine.com. 242-366-0000 / 0001; Fax: 242-366-0366. Located next to the school & near new cell tower. In Dec 2014 office was open only on Tuesdays after 0930. Fax: Hope Town Hideaways will send faxes; there is a per-page charge . See Abaco Cruisers Net page for a calendar of local events. T & N Cart Rental; 242-366-0069. There is excellent coverage in Hope Town; a new cell tower was installed in 2013. There is also an ALIV cell tower. Catholic; a priest from Marsh Harbour holds services on Sundays ~1230 under the trees at the Library and playground. St. James Methodist Church; located on the ocean. Hope Town Coffee House; 242-366-0760. Located at Front St. and Lovers Lane. Open M-F 0800-1500; Sat 0800-1200. Offers expresso, coffee, tea, pastry, quiches. Free wifi for patrons. There is a large deck with tables overlooking the harbor. Hope Town Light House Society. A group of volunteers dedicated to operating, maintaining, and upgrading the historic lighthouse. The current need is financial support to replace the windows that are cracking due to corrosion induced stresses. Donations are welcome. Every Child Counts, Abaco. A well recognized and respected school for children with special needs. Donations to help them continue to do magic are welcome. Abaco Cruisers Net operates daily on VHF Ch 68 from 0815 to ~0915. The goals of the net are safety, friendship, and message handling. The net provides weather, notices from local businesses, messaging between cruisers, arrivals and departures. There is no Customs and Immigration services available at Hope Town. The nearest location is at Marsh Harbour through one of the marinas. Government pier; SE corner of the harbor. Town Pier at NW corner of the harbor. Note: be a good visitor by using stern anchors and long painters. Save the dunes: use marked trails and passages. BASRA; 242-366-0500; VHF Ch-16, Ch-20. Hope Town Volunteer Fire Brigade & Rescue; 242-366-0023; VHF Ch-16, VHF Ch-72. Cruisers who need to be contacted in an emergency can receive an email if it is sent with contact information (boat name; persons name; cottage name) in the Subject line; email to: cruisers@oii.net This is provided as a free service by Out Island Internet. Down Deep Island Seafood; VHF Ch-16; 242-366-3143. Friday afternoons fresh fish sold on Post Office Dock. Call for availability at other times. Lighthouse Marina; 242-366-0154 / 0172. info@lighthousemarina.com; VHF Ch 16. Diesel and gasoline. Hope Town Cart Rentals; 242-366-0064. Island Cart Rentals; 242-366-0448; info@islandscartrentals.com; VHF Ch-16. Hope Town Lighthouse; 242-366-0520 / 0521. Gates Greens; 242-366-0074; gates construction@gmail.com. Billy Gates of Gates Construction grows fresh herbs, spices, and greens. Call or visit Ferry Dock on Friday afternoons. Harbor View Grocery; 242-366-0033 / 0035. Overlooking the harbor near Captain Jack’s it is open Monday - Friday 0800-1300 and 1400-1600 hrs; Saturday 0800-1600. LVA Convenience Store; 242-366-0056. Open Sunday. Omgrown Greens; 242-366-0722; info@omgwowngreens.com. Fresh greens and sprouts grown organically in Hope Town. Vernon’s Grocery; 242-366-0037; vernonsgrocery37@yahoo.com. Vernon makes the best key lime pies in the Bahamas - don't miss it. Visit the Wyannie Malone Historical Museum to watch an informative video on the history of the Abacos and Hope Town. The Hope Town Lighthouse, now a much-loved icon of Hope Town, was not looked upon favorably by local residents when it was built in the 1800's because it would reduce their livelihood from salvaging ship wrecks on Elbow Reef. They did much to inhibit and sabotage the construction but the British lighthouse authorities prevailed. The present kerosene lamp, fresnel lens, and clockwork rotation mechanism were installed in the 1930s from an abandoned lighthouse. Hope Town Wines and Spirits; 242-366-0525; hopetownwines@abacoinet.com; VHF Ch 16. Located at Lighthouse Marina. oii.net & Bahamas WiMax provide strong WiFi in the harbor. Captain Jack's Restaurant & Bar. Free WiFi for patrons. Hope Town Coffee House. Free WiFi for patrons. Hope Town Inn & Marina. Free WiFi for patrons. BTC Cellular Data Service: In Dec 2014 3G data service was available in the harbor with a strong signal from the new local tower. Hope Town Inn and Marina. 2 token-operated washers and driers. New Laundromat; 2 machines at bike shop next to Harbors Edge. Located on the edge of the park by the Post Office Pier just to the N of the waterfront playground. Hours of operation (volunteers permitting): Monday through Friday 1000-1200. Elbow Cay Properties; 242-366-0569; elbowcayproperties#coralwave.com. Secluded one bedroom cottages to six bedroom villas. Hope Town Harbouir Lodge; 242-366-0095; 866-611-9791 (US); info@hopetownlodgew.com. Hope Town Hideaways; 242-366-0224; info@hopetown.com. Rental homes from honeymoon cottages to multi-family beach houses with pools. [website has a good travel advice section]. Hope Town Inn & Marina Ltd.; 242-366-0003; 242-357-6775; office@hopetownmarina.com. Rental villas. Hope Town Lodge; 242-366-0134 / 0095 / 0020. Hope Town Villas; 242-366-0030 / 0266 Four vacation rental villas on the waterfront. Lighthouse Marina & Resort; 242-366-0154 / 0172. Parliament Harbour House; 242-366-0224; info@hopetown.com. Renovated loyalist home on harbor. There is regular ferry service to and from Marsh Harbour several times a day. Packages and mail can be shipped by arrangement. There is daily freight boat service from Marsh Harbour. Lighthouse Marina; 242-366-0154 / 0172. info@lighthousemarina.com; VHF Ch 16. 6 Slips. Fuel. Hope Town Inn & Marina Ltd.; 242-366-0003; 242-357-6775; office@hopetownmarina.com. This beautiful marina occupies the W side of the harbor S of the lighthouse. The operators have combined this marina with the old Club Soleil and Hope Town Hideaways Marina and have made major improvements with new piers that can accommodate a vessel up to 125' LOA. There several new villas for rent. There is a beautiful pool and a pool bar and restaurant. Lighthouse Marina (Yamaha). Ships store. Lighthouse Marina; 242-366-0154; info@lighthousemarina.com; VHF Ch 16. Yamaha outboard service; 10-ton travel lift. Full service repairs. Craig Knowles of Lighthouse Marina does marine surveys. Government clinic with nurse; 242-366-0108. There are many moorings available in the harbor. However there is little organization as they have been placed by several different local residents. In 2012 a moratorium on putting in more moorings went into effect so it is unlikely the mooring field will increase in number. The general rule is to pick up one that is unoccupied and not marked private where the water is deep enough. Depth in the harbor thins out toward the S edge. So moderate draft vessels have a greater choice. If you don't know the owner of the mooring, eventually the owner will find you to collect. Truman Major; VHF Ch-16, "Lucky Strike"; 242-366-0101. Has been operating a mooring business in Hope Town Harbour for > 40 years. He has 23 moorings marked with double green floats. He services then twice a year and after storms. Contact for monthly rates. Call on VHF and he will come alongside in his boat in the evenings. Jan 2014 rate was $20/night. Hope Town Inn & Marina. Has a number of rental moorings marked with two red or two blue floats. Captain Jack's Restaurant & Bar; 242-366-0247; fourrussells@batelnet.bs; VHF Ch-16. has 4 moorings white with blue stripe and with Captain Jack's written on them. Cost: $20 / night; $105 / week. You can contact to see if it is possible to reserve one. There are conical mooring floats in the SW corner of the harbor for rent. Vessels with a draft of about 6' or more will need mid-tide or better to enter the harbor. The Explorer chart shows a "deep draft" route that when followed has its controlling depth just E of the sharp turn to the N to parallel the shore. A bit unnerving but SV Onward with a 6.2' draft has safely made the transit many times on a rising tide. Take care at the marked entrance channel. There is a shallow spot on the red side of the channel right at the outer red buoy; favor the green side. IE Imports / Inter-Island Export; 242-367-3622 (Marsh Harbour); 561-210-5059, 954-793-7508 (US). Will air ship packages to Marsh Harbour that are sent to their West Palm Beach FL office. They will handle customs and can arrange delivery to Hope Town by ferry or freight boat. Back to Basics Massage & Yoga; 242-366-3141. Chopping Block Hair Salon; 242-366-0052. 242-366-0667. Office is in the Government Building across from the town dock. 242-366-0098 / 0667. Located at Government Dock, green building. Hope Town Harbour Lodge; 242-366-0095; 866-611-9797; info@hopetownlodge.com. Abaco Inn; 242-366-0133 & 800-468-8799; events@abacoinn.com. Located on the ocean and White Sound S of Hope Town center. They will provide rides from town. There is a dinghy dock on White Sound. Friday is prime rib night. Sunday breakfast with complementary mimosas. Boat House Restaurant at Sea Spray Resort & Marina; 242-366-0065. Located on White Sound. They will provide rides from town. Captain Jack's Restaurant & Bar; 242-366-0247; fourrussells@batelnet.bs; VHF Ch-16. 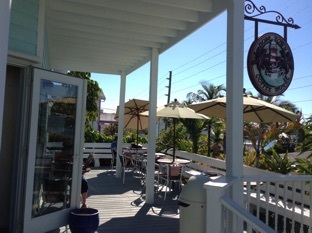 On the waterfront; specializing in Bahamian foods; offers daily specials. Monday: bingo night. Tuesday: Taco Tuesday with 2 for 1 margharitas; Thursday: trivia night. Friday: steak night. Saturday spaghetti night. Free WiFi for patrons. Hope Town Coffee House; 242-366-0760 Located at Front St. and Lovers Lane. Coffee & Tea, pastry. Great location and ambiance. They were rated Conde Nast's favorite Cafe in The Bahamas. Harbour's Edge; 242-366-0087 / 0292; VHF Ch-16. 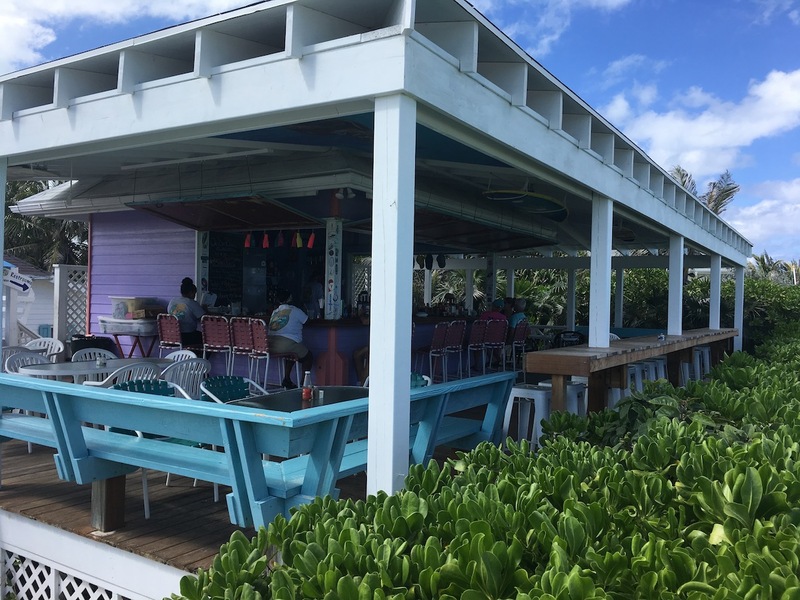 Bahamian cuisine on the waterfront; bar, lunch, dinner; closed Tuesdays. Hope Town Harbour Lodge; 242-366-0095; 866-611-9797; info@hopetownlodge.com. Restaurant open 7 days a week. Hope Town Inn & Marina Ltd.; 242-366-0003; 242-357-6775; office@hopetownmarina.com. Pool bar and grill. Munchies; 242-366-0423. A grill offering sandwiches and salads with a small indoor sit-down area and outdoor picnic tables. On Da Beach; 242-366-0065. Great beach bar and grill on the dunes just S of town. They will provide rides from town. Sugar Shack; 242-366-0788; abacosugarshack@yahoo.com. Deli sandwiches; ice cream. Wine Down Sip-Sip; 242-366-0399; Arnold & Bonnie Hall; Wine & cheese bar; cookbook library; wifi; events. A nice low-key comfortable place to sit and talk over good wine, beer, or drinks. Open for breakfast, lunch and dinner; wonderful flatbreads and delicious specials. Public restrooms are located on the harbor across the street from the public dock and S of the clinic. Ebb Tide; 242-366-0088. Unique Bahamian Gifts. Fantasy Boutique; 242-366-0537. T-Shirts, Arts & Crafts, Cuban Cigars, Souvenirs, Island Music, Beach Wraps, etc..
Iggy Biggy Boutique; 242-366-0354. Resort wear, gifts — one of the best selections in the area. Hope Town Lighthouse Gift Shop. A beautiful new gift shop has been built at the foot of the lighthouse with a good selection of items celebrating the historic light. Lighthouse Marina; 242-366-0154 / 0172. info@lighthousemarina.com. Boutique. Captain Plug's Adventures; 242-366-0023 / 0554. Froggies Outisland Adventure; 242-366-0431. Half and full day dive trips. Trips to outlying islands and national parks. Elbow Cay Light Station. Visit the signature lighthouse for Hope Town. Climb to the light level and get a breathtaking view. See one of the last oil-fed lights in operation. Become a supporter of the Lighthouse Society as they raise funds to replace the window. Wyannie Malone Historical Museum; 242-366-0293; wyanniemalonemuseum@gmail.com. Open 1 November - 31 July; Monday - Saturday; 1000-1500. Located near Post Office Dock. Hope Town Sailing Club. Hosts a regular series of races open to all. The Great Abaco Express; 242-367-0200; 242-646-7072; thegreatabacoexpress@yahoo.com. Guided Eco-friendly tours of Abaco, Man-o-War, Hope Town. Hope Town Memorial Garden. Located on the ocean E of The Sugar Shack. A piece of derelict land has been turned into a beautiful memorial garden with a peaceful overlook of the ocean. VHF Ch-16 is used for emergencies and local commercial hailing. Use VHF Ch-68 for hailing. Do not use channels used for local safety & operations: VHF Chs 22, 72, 77, 80. Beach clean up forays are organized regularly. Announcements are made on the Cruisers Net on VHF Ch-68 at 0815. Hope Town Library needs volunteer help to meets its schedule of openings: Monday - Friday 1000-1200. Wyannie Malone Historical Museum needs volunteers to support the Museum and the Memorial Garden. St. James Methodist Church is raising funds for a new community center. Donate and help the community! RO water is available at marinas at $0.25 / gal.